University of Nottingham > Blogs > Sport at UoN > Staff > Over 100 UoN Staff enjoy first ever Winter Cup Competition! 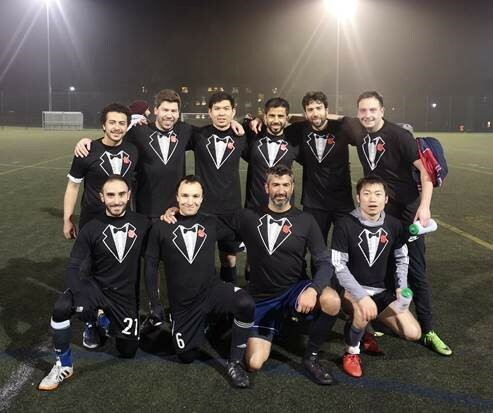 On Thursday 24th January, over 100 staff members from a variety of university departments braved the cold to compete in the first University of Nottingham 7v7 Football Winter Cup at the David Ross Sports Village. There was plenty of exciting action but above all, matches were played in great spirits with everyone enjoying the evening. The winners of the best team name was Don Score Leone from the Engineering Department, they star in the featured image. The winners of the tournament were PGSA Old Boys after an exciting semi- final! Thanks to UoN Men’s Football for volunteering to help officiate the event. If you enjoyed the event or fancy getting into football there will be social “turn up and play” sessions for staff on Thursdays from 5.30-6.30pm at DRSV, and everyone is invited! This session is free for Sports Members and £3 for Non-members. Entry is through DRSV reception. Email Daniel.smith1@nottingham.ac.uk for more information.